November 1940. Tulare County, California. "One of the homes at Mineral King cooperative farm, an old ranch of 500 acres raising cotton, alfalfa, and dairy products for cash crops. Ten families [including the Schmidts] have been established here by the Farm Security Administration in modern houses." Forerunner of the suburban ranch house that characterized so much postwar residential development. Medium format negative by Russell Lee. View full size. Submitted by safe as milk on Mon, 09/10/2018 - 4:15pm. There are two poles with a horizontal wire strung between them above the house. In the center, there is a vertical lead to the house. I love the house and imagine myself listening to Mexican border blaster stations on a big Zenith radio in the living room. Submitted by rzr on Fri, 08/31/2018 - 9:49am. 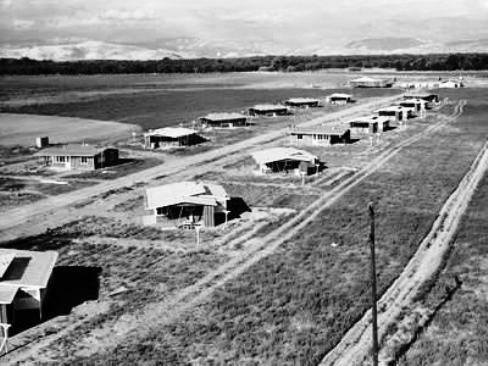 Three of these homes are still standing on Road 158 in Visalia, CA. Wonder which one was #4? Submitted by WoodsideParkBob on Thu, 08/30/2018 - 3:57pm. My house just outside of Washington, D.C. and build in 1938 has a long wire AM radio antenna in the attic. It is connected to what looks like a vertical 2 prong electrical socket in one wall of the living room. The socket is actually for both the antenna in the attic and a ground connection. If big console AM radios ever make a comeback, I'm ready! Of course the metal roof of the Mineral King home would rule out putting their antenna in the attic. Submitted by JohnBraungart on Thu, 08/30/2018 - 3:35pm. Is one of those homes designated the Schmidthouse? Mineral King Cooperative Farm story? Submitted by bohneyjames on Thu, 08/30/2018 - 2:29pm. The Mineral King Cooperative Farm photos (particularly this exterior shot of an early "ranch style' home) have piqued my interest. 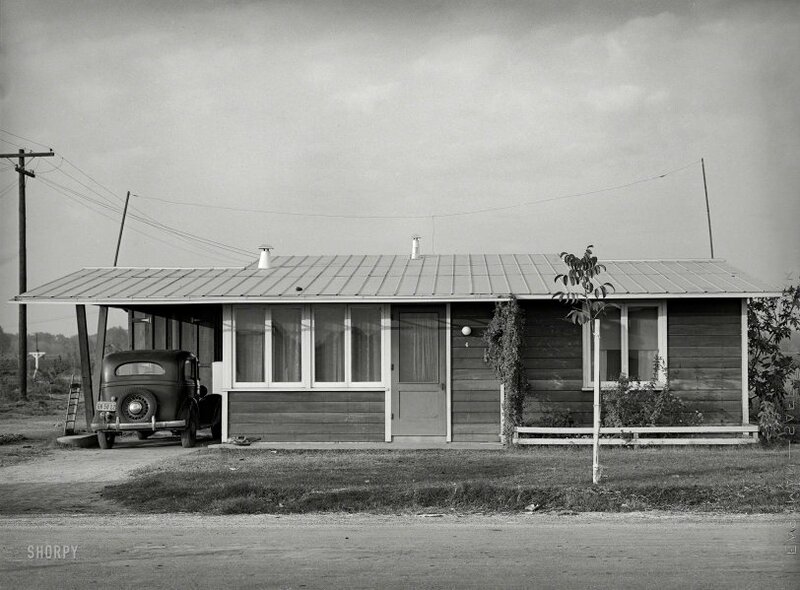 I poked around and found this Dorothea Lange photo of the original group of houses on the farm, which is notable because of the "rotational" placement of the houses. So - where was the farm, and what happened to it? I found a few other Lange & Lee photos from the time, but nothing else. Submitted by gptgpt on Thu, 08/30/2018 - 1:16pm. Looks like they have their Long Wire Radio Antenna installed and ready to pull in their favorite programs.